Don�t forget Random Access files! You may think that ADOCE is the only way to create useful data tables, but not so. 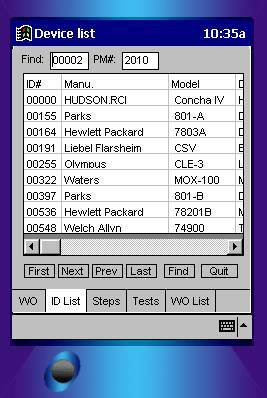 Before databases even existed for me, I was creating data tables in Basic using Random Access files. They are generally faster and fairly easy to create, but a little harder to work with because more work is needed to sort and search for things. Yet, I have found them a lot faster to work with on small Palm Size PC�s and Pocket-PC's than the ADOCE tables that can be created. For instance, I have a Medical Equipment file that contains about 9820 records of 115 characters in a 1.2 meg file, yet I can find any device in this table in less than a second. The longest time taken is loading a grid with the information, and that takes less than a second. And with random access files, you can add records, sort in different ways, delete records, and do all the other database things you need to do. Not always easily, but working with ADOCE can be a pain as well. FoxPro .dbf --> Access .mdb --> device .cdb, 75 min for a 1 meg file, et vice versa, definitely too long a process. BioMstr.txt for device (~30 sec to create), 1,176,565 bytes. WOFile.txt for Device (~3 min to create), 2273 Work Order records (just the latest work orders), 488,695 bytes with 100 character notes. 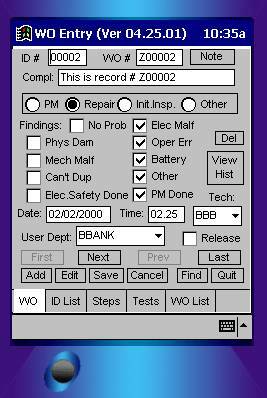 For a complete history, this represents 20,972 records, 7,843,902 bytes on the device with 255 character notes. This easily fits on a 32 meg Pocket-PC. We use Compaq iPaqs. If all files have been updated, ActiveSync will finish loading these files in less than two minutes. If just Work Orders Due are updated, ActiveSync will finish in about 1/2 minute. So let�s start out with what a random access file is by looking at how one can be created from a FoxPro data file. As you can see, each field can be a different length, or even empty as the case may be. An SDF file is similar, but the fields are of fixed length. Each record, however, still consists of a single line with a CRLF at the end. I put the manufacturer first, then the five digit ID number, the model number, description, serial number, date tested, date serviced, and the PM test number. I put the manufacturer first because when the ID number is put first, the conversion has a tendency to remove the �0�s� from the beginning of the record. Putting the manufacturer first is normally not going to be a problem, however, since we are going to pick out the fields that we need from each record when it�s converted to a random access file anyway. We�ll show how later. When we convert from an SDF file to a random access file all we have to know is the exact length of each record. Following is the Visual Basic 6 code to create the master text file from the SDF file, but before we get into the code, let me explain a couple things I do for my programs: all, or most of, my global variables begin with �g�, local variables begin with an �l�, character variables have a �c�, numbers have an �n�, arrays have an �a�, and I try to use upper and lower case for the names. I always make two constants in Basic, �t� for �True� and �f� for �False�, this keeps the typing down and saves some space when programming on the device itself. 'file from the E:\BIOMSTRC.TXT SDF file. 'sure that the SDF file is current. Because I work at home and at work, or if I just want to test the application, I have some option controls, OptTest, OptHome, OptWork, and OptEmul that I can set to have the output file put in a number of places. The default is to the root directory of one of my hard drives. But it can also go to the emulation directory which is available on my work NT workstation, or one of the sync directories. When placed in a sync directory, it automatically gets put onto the device when synced up. This next bit of code sets the Path for our output files. gcOutFilePath = "C:\WINNT\Personal\Pocket_PC_SCARP My Documents\Work Order Entry\"
'gcOutFilePath = "E:\Windows CE Tools\wce211\ms palm size pc\emulation\palm211\"
gcOutFilePath = "E:\Windows CE Tools\wce300\MS Pocket PC\emulation\palm300\Program Files\Work Order Entry\"
Which calls this following routine. lblMsg.Caption = "Creating Master file..."
Open FileInName For Input As #1, so we have to have an actual file name, and a file number that we can get from the FreeFile function which gets the next available file handle. MsgBox "Error opening " & lcFileName & " data file." & vbCrLf & Err.Description, vbCritical, "Create File"
MsgBox "Error opening " & lcFileOut & " data file." & vbCrLf & Err.Description, vbCritical, "Create File"
We save the number of records we�ve created and close the files. You can examine the output file using Notepad or Wordpad, but you should note that the header will display as some unknown ASCII characters, there won�t be any CRLF at the end because each record is fixed in length, and the file will be just one long string. My form also has a few extra controls on it so that I can create an index, reindex, and view the file, but we won't go into that in this article. Creating an index is handy, and adding a binary search makes finding random access records real fast. Perhaps we can go into that in another article. Now that we have created the file, and it resides on the device, what�s next? We will now actually read in the records with a program that resides on the device. Next section. When the Random Access file was created above, it would have normally been put into the sync directory, and if so, will eventually end up on the device. If you have Windows NT or Windows 2000, you can also put it into the emulation directory for much faster testing. However, we really want the files on the Palm Size PC or Pocket-PC device when we are doing the real work of entering work orders. When the Random Access file is on the device we have to open it, and then store the information from the random access records, into a grid. These are views using the emulator, the forms are very similar when actually on the device. And the eMbedded Visual Basic 3.0 code for the device follows. We start with some constants and global variables, then set the directory where the file ended up on the device. gcDirectory = "My Documents\Work Order Entry\"
When the form loads we open the files, and if there was an error we exit, else we display the application title and version number, and put our cursor into the field we want it to be, in this case the equipment ID field. gcFormCap = "Opening files, standby..."
This routine normally opens a lot of files, one after the other, but for this article we are only looking at the one we created above. gcFormCap = "Opening Master file, standby..."
The above routine calls the following routine. The fsModeRandom, fsAccessRead, fsLockRead variables are normally initialized at the beginning of the program, but we put in their values here for you to see. So we open the file and check for an error. MsgBox "Error opening " & lcFileName & " data file." & vbCrLf & Err.Description, vbCritical, "Work Orders"
This next code determines how many records we have in the file with a little math, and then get the record length the same way. This I can use for checking the length of the record when testing. Then we put the first few records into a grid on the form. This following bit of code does two things: if the Find field has any data it, we are in a search mode where we look for the ID number. That code is not in this article. What we do set up, however, is what records we start and end at. Rather than load every single record into the grid, which slows the whole process down (we can have thousands of records), we only load enough to show on the screen in the grid. Then, if you notice on the form, we can use navigate buttons to move through these records simply by incrementing and decrementing gnStartRec and gnEndRec. This following code first sets the grid up. I won�t cover every line since they are all in the help files on grids. Then we set a For/Next loop that gets each record (GetIDRec), and puts each field into an array, and then into the type of line the grid wants. strRow = "ID#" & Chr(9) & "Manu." & Chr(9) & "Model" & Chr(9) & "Description" & Chr(9) & "Serial #" & Chr(9) & "Date PM" & Chr(9) & "Date Serv" & Chr(9) & "PM #" & Chr(9) & "JFMAMJJASOND"
Notice below that the ID number, gaIDRec(1), which is in the second field position, is now displayed in the first position. And also note that arrays will start with 0. The following code is really where we reverse the process: retrieving the data from the random access record. We get one record from the random access file, separate each field out, and put them into an array. You may ask why not put the fields directly into the grid. Well, you could, but arrays are good to work with, they are fast, and they're even better when debugging. These next few lines basically show how my device record is set up. If you remember from above, what we have is the manufacture�s name, the device�s ID number, the model, description, serial number, and some dates and a bit of other information we need. If you display the record this way, you can easily tell how large each field is and where it starts; it's a big help during development to look at the record this way. By the way, you want to use a fixed length font such as Courier New when doing this. Don't even bother trying it with something else. Because the data is longer than this page, some information at the end is truncated off. This next bit of code gets the individual record from the file. It will take the single line, like the last line above, and puts the record into the variable lcIDRec. MsgBox "Error Getting record" & vbCrLf & Err.Description, vbCritical, "Error Encountered"
We now put that line into a global variable so the next routine can see it. This code also does some converting of the data. And finally puts the field data into a global array with the LoadIDArray routine. This code will pull each field into the array by using the Mid() function. As you can see, this is why the formatted lines above help with this bit of code; we know where the field starts and how long it is. Since we are always working with text files and character strings, the code is very fast. This is very important in a hand held device with a slow or slower processor. So if you need this kind of speed, forget database files in Access and go with Random Access.